إذا كنت تبحث عن فندق بموقع جيد في كاكاداو، فقد وجدت ضالتك في Mercure Kakadu Crocodile Hotel . يمكن من هنا للضيوف الاستمتاع بسهولة الوصول إلى كل ما تقدمه هذه المدينة النابضة بالحياة. يشكل هذا الفندق ملاذاَ مريحاً للاسترخاء ويمنح زواره فرصة للاستجمام والتجدد، وهو يقع على بعد خطوات من المعالم السياحية الكثيرة للمدينة كمثل: كاكادو ناشيونال بارك. إن الخدمات التي يقدمها Mercure Kakadu Crocodile Hotel تضمن للنزلاء إقامة مريحة. يقدم هذا الفندق العديد من الخدمات الكفيلة بإرضاء أكثر الضيوف تطلباً. تتضمن كل غرف النزلاء وسائل الراحة والتسلية المصممة خصيصاً لضمان الراحة القصوى للضيوف. إن مركز للياقة البدنية, مسار جولف - ضمن 3 كم, حمام سباحة خارجي, حديقة هو المكان الأمثل في الفندق للاسترخاء وتفريغ طاقتك بعد نهار طويل. استمتع بخدمات لا يعلى عليها وعنوان ذو اعتبار في Mercure Kakadu Crocodile Hotel . The Mercure crocodile hotel is very central to Kakadu and has a very good restaurant which is open even in the wet season. They make good coffee and good drinks. The staff are friendly and a very nice Northern Territory people. We could access the aeroplane flight and the river cruise from the hotel. There is also a supermarket next-door for stocking up on supplies. Some of the reviews I had read weren't that complimentary but we were pleased with just about everything. Yes, the hotel is 35 years old and some of the facilities are a bit tired but the staff were pleasant, everything worked and we had a great time. My room on the ground floor was well appointed with everything that I needed. Reception staff were most helpful in arranging tours for me; even to the extent where the young reception manager took me in his free time to the river - a 40 min drive away - to enjoy a cruise as I had no vehicle. That to me was above and beyond.... The restaurant serves delicious meals, especially the ginga (crocodile) wontons. Most happy with my stay. It's a fun hotel in the pop-up town of Jabiru. Seems like the hotel was designed with Japanese visitors in mind, especially the dining room. However, the food is typical outback fare, mostly frozen and heated up. It's a shame that most cocktails aren't available, as the tropical atmosphere would be great for a few poolside drinks. Loved the place though and would go back. Considering the lack of accommodation options in Kakadu National Park, Croc Hotel is one of the best in terms of location. Staff were very friendly and we felt welcomed. Swimming pool is the smallest one we have seen in Kakadu, which is a shame. A comfortable clean and neat room for the 3 of us. Staff were friendly and accommodative to our requests. Hotel needs to be totally updated. The rooms are in need of new beds new fridges, carpet, paint and new everything. No microwave on fridge big enough to put your own drinks or prefer a quick snack Food at hotel to expensive to be consumed there everyday. Although staff and food we tested was excellent.. however no many services available in town either and due to being the beginning of wet season many sites were also close. Not a place I would visit again. I was overall disappointed with Kakadu in general. The hotel I thought was a little bit pricey for the standard, but there’s also not a lot of choice for accommodation in the area. The town is very small with one sho that has limited opening hours at the weekend. The hotel needs a bit of an upgrade to really meet the price . The pool was adequate although it seemed a bit of a murky colour. Buffet breakfast was great with lots of variety but a bit expensive at $29 per head. Dinner was good with either a la cartel or buffet, we chose buffet style at &49 each but we had the wine and dine which made the cost a little easier at $90 for 2 adults PLUS a bottle of wine this was a good promotion. Location was ideal for Nourlangie Rock, and other tours, but be advised to visit early morning due to the heat! This hotel needs competition as it’s very expensive for what you get. The bathrooms are dirty the Crome handles have never been polished. A good spray of diluted Janola would fix the mouldy grouting. Staff at hotel are mostly great with the odd grumpy face. Expected much better for the money! Clean accommodation, centrally located. Great restaurant with excellent food options. Breakfast was the highlight for my boys. The place is clean and the staff there are very helpful and friendly. 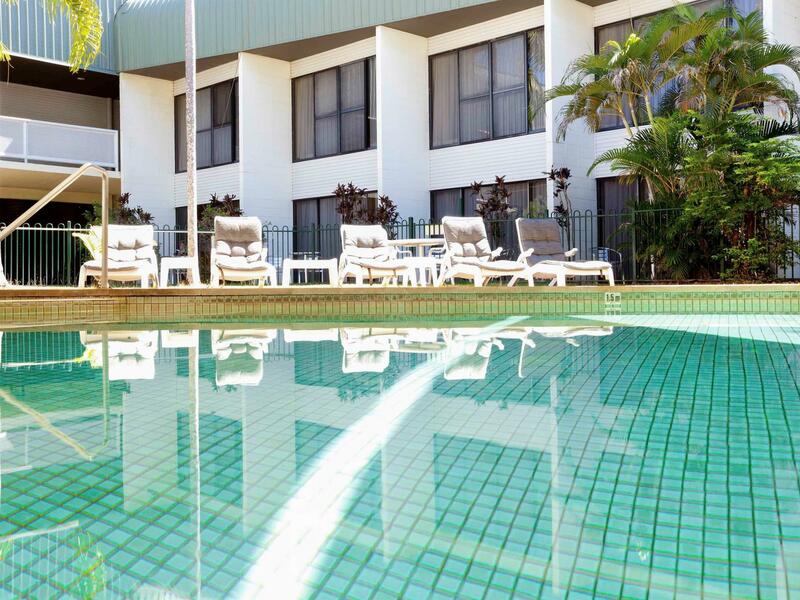 There is really only one place to stay in Jabiru, the facilities are fine and the rooms are spacious and comfortable. The buffet breakfast is a bit ad hoc with various machines not working but it provides a great start to the day as it opens at six am. The reception staff were helpful apart from the check in process which did not provide us with enough information and also held my safety 'deposit' long after we left. I love that the hotel is owned by the traditional owners of the country first and foremost. I also love the quirkiness of the shape of the hotel from the air looking like a crocodile. Booking was easy, we were upgraded at check in, the room and hotel were attractive (including the art gallery) and very comfortable. We had a refreshing swim in the pool and walk alongside attractive gardens and pools. The staff provided us with helpful information and we booked a fabulous Yellow Waters cruise in the morning. The gift shop had a great range of souvenirs at good prices. We didn't use the restaurant although it looked good. The only minor improvement might be having a lift to take guests up to the first floor. Despite this the staff offered to help take luggage up the stairs. The bedroom was very comfortable although we found hair in the toilet bowl on arrival. The kitchen was unable to provide the meals to the restaurant one night which caused alot of unhappy clients. The main restaurant and bar needs a makeover. It is convenient and not too many other options around.... and though it is now a Mercure (from Accor) you will not find their standards as per staff performance and room decoration. Restaurant was good, specially at dinner but so found of breakfast. Be aware that hotel is IN the National Park and no shop or petrol station will sell alcohol, so either you bring it with you from Darwin or you can only consume in the bar-restaurants and a much higher rate!